Designed for minimal footprint requirements, space savings of 37%. 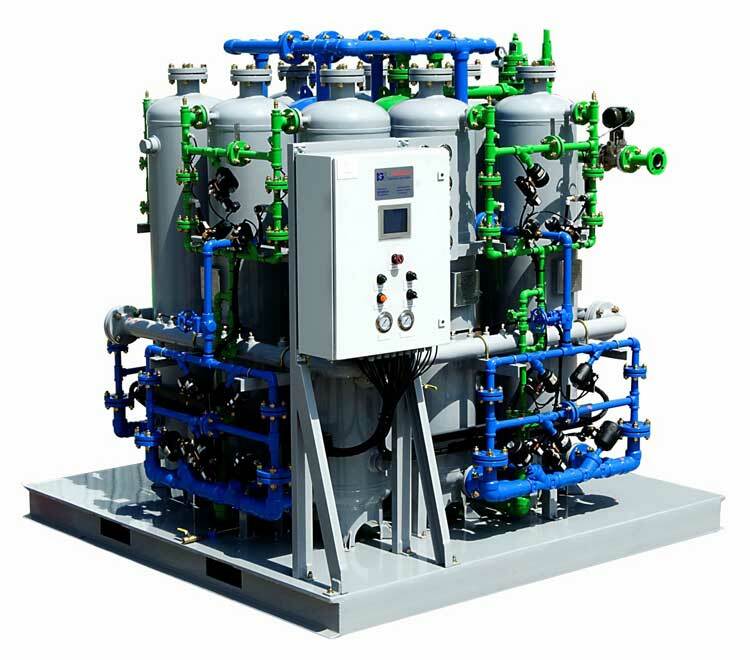 Applications include FNLG, FPSOs, Platforms & anywhere high purity nitrogen is needed. Designed for minimal height requirements, space savings of 30%. GENERON‘s® Nitrogen Sequential PSA Generators are engineered and designed to meet the stringent demands of the Oil & Gas Markets. The Nitrogen Sequential PSA process consists of multiple individual Twin Tower Adsorber Vessels operating on alternating cycles. By utilizing this sequential operation of the individual PSAs, the requirement of large buffer tanks is eliminated from the process. GENERON® Sequential PSA producing 6,600 SCFH @ 99.9% 8′ X 8′ X 8′ Without the need of large buffer tanks, there is a 37% reduction in footprint.